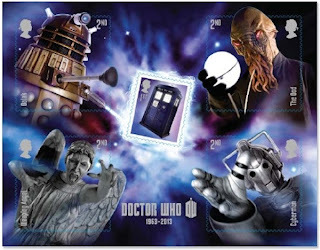 Doctor Who stamps will be Royal Mail's blockbuster issue in 2013 - start saving now! As was forecast long ago, Royal Mail will mark 50th years of the BBC Doctor Who series with a blockbuster issue of stamps and booklets. 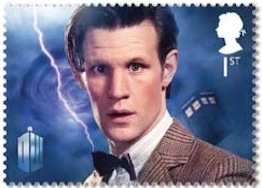 Originally reported to be issued in 8 January (a report repeated in error by at least one daily newspaper last week) the stamp issue will be on 26th March 2013. Royal Mail chose 26th December to publish the press release for this issue, to get maximum coverage in the British media. With the government and politics in general very quiet over Christmas the coverage achieved was predictably wide so you probably already know about the basics. Now, we bring you the bigger picture. 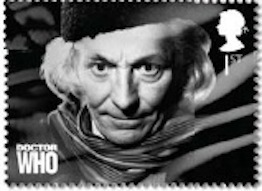 The first Doctor Who episode was broadcast on 23 November 1963 at 5.15pm, but Royal Mail and the BBC are wisely marking the 50th anniversary throughout 2013. 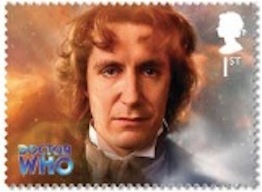 Each of the 11 Doctors is featured on a 1st class stamp. The first two, William Hartnell and Patrick Troughton are in monochrome, while the remaining 9 are in full colour. The stamps are printed in three sheets, 11-9, 8-5, 4-1, by Cartor Security Printing in litho. The miniature sheet shows the TARDIS and four of the Doctor's enemies. 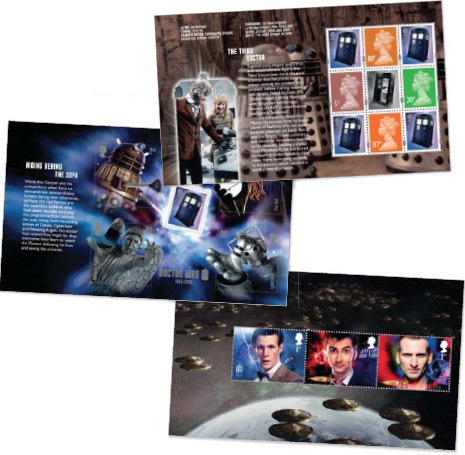 The sheet is self-adhesive and the publicity pictures suggest that the four 2nd class stamps have designs extending beyond the perforations, and these may be 'free-form' die-cut as was used with the Charles Darwin stamps. 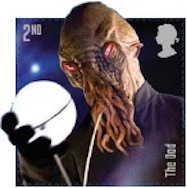 We've modified the image to show what we think individual stamps might look like. This has not been confirmed by Royal Mail. The prestige stamp book contains 5 panes of stamps. 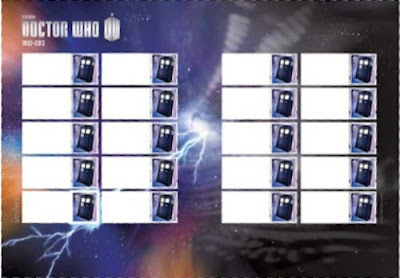 The 11 Doctors are split over 3 panes, but these images have narratives unrelated to the Doctors on the pages. These are publicity pictures which are subject to change; the images are low resolution. 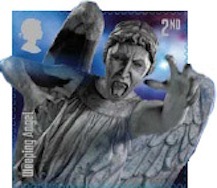 The announced price of the PSB is £13.77 (as usual, almost £1 over the £12.82 face value of the stamps). Definitive, miniature sheet, Doctors 11-9, 8-5, and 4-1. All panes are gummed except for the mini-sheet pane, which is self-adhesive. 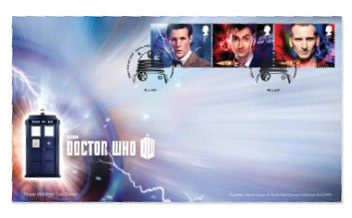 Machin/Tardis pane is by Walsall in Gravure, with iridescent security layer on the Machins but not the Tardis stamps. 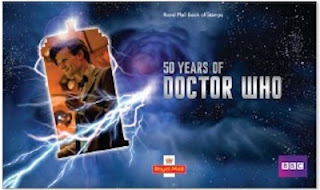 Maintaining the distinction between the (8) Old Doctors and the (3) New Doctors the Prestige stamp book has two covers, and two ends. 6. (The Time Lord Returns / monsters from the modern day info pages). 13. Monochrome cover, with FSC logo and bar-code. We now have the Miniature Sheet pane from the PSBs. 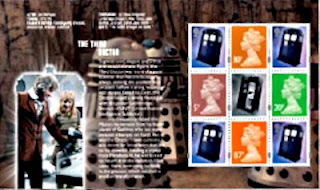 Although there may be some technical details (above) still to be verified by Royal Mail we can confirm that the stamps in the PSB are not the same as those on the MS. The phosphor bands on the 'enemies' stamps are fractionally wider on the MS than on the PSB pane. The gap between the bands is 11mm on the MS and about 7mm on the PSB pane. 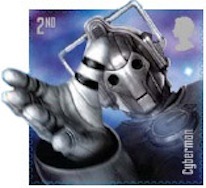 The paper surface is different, which means the bands appear sold on the PSB but not on the MS.
We're now just waiting for the Generic Sheet to confirm that that the Tardis stamp in that will also be different. 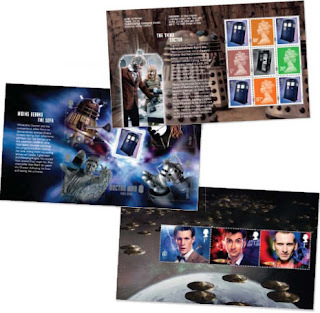 The Tardis stamp in the retail booklet has phosphor bands almost exactly the same size as those on the MS, but the stamp image size is different! On the MS & PSB the image size is 17 x 21 mm. In the retail booklet it is 17.5 x 21.25mm. 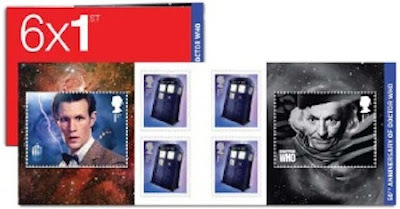 There are 4 Official Royal Mail first day covers, using the postmarks shown below. The miniature sheet, and the definitive (half-)pane from the PSB are on two. 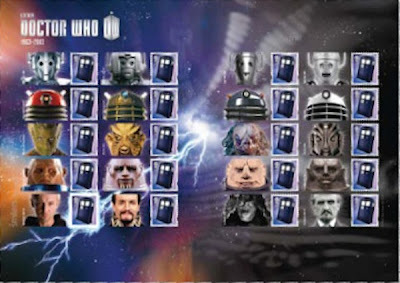 The 11 Doctors are split between the 8 Classic and 3 Modern Doctors. The publicity pictures show the Classic stamps on a cover with a different design. However, only one blank FDC has been listed for us to order, so either the image or the order form is in error. 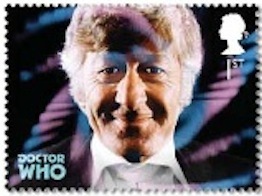 Royal Mail will use the multicoloured one for the three recent Doctors, Mini Sheet and PSB (Machin) Pane. 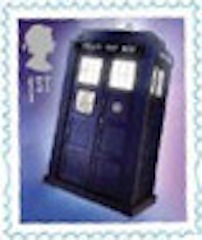 The Tardis stamp is being made available in Royal Mail's Smilers (c) service, and so a generic sheet will also be issued. The generic sheet will comprise of 20 1st Class TARDIS definitives accompanied by labels featuring four different incarnations of Cybermen, Daleks, Silurians, Sontarans and the Master. Cost from Royal Mail £12.50. 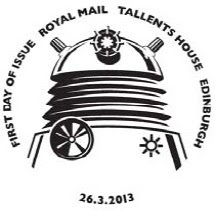 The TARDIS stamp will be in the consumer Smilers service and the Business Customised Service. Smilers are available at www.royalmail.com/smilers and also through the iPhone App. Smilers will be available in sheets of 10 and 20 stamps (sheets of 20 perforated down the centre). Personalised Smilers are £9.99 for 10, £18.25 for 20. Royal Mail will issue 17 stamp cards - one for each stamp and one for the miniature sheet - which can only be obtained in sets price £7.65. The presentation pack containing all 11 stamps and the miniature sheet is £9.70 (50p over face value). How to get the stamps and other products. Royal Mail have made it easy to buy these, on a new webpage. g. first day covers of a, b, d or serviced stamp cards. k. single stamps from Generic Smilers sheet. Details and prices will appear on our website. 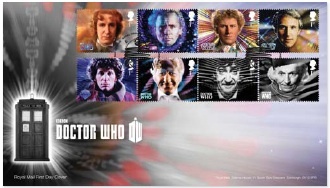 The Post Office (rather than Royal Mail) have a blogpost which includes a Dr Who Timeline. In theory it should be there forever, but I can't vouch for that. Stamp (etc) images Copyright Royal Mail 2013. 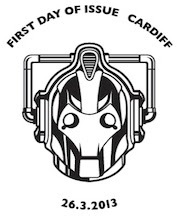 BBC, DOCTOR WHO (word marks, logos and devices), TARDIS, DALEKS, CYBERMAN and K-9 (word marks and devices) are trade marks of the British Broadcasting Corporation and are used under licence. BBC logo © BBC 1996. 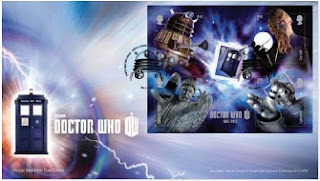 Doctor Who logo © BBC 2012. Dalek image © BBC/Terry Nation 1963. Cyberman image © BBC/Kit Pedler/Gerry Davis 1966. K-9 image © BBC/Bob Baker/Dave Martin 1977. 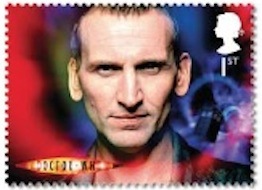 Two of the actors who played Doctors have previously appeared on British stamps - can you remember which stamps? So much for Royal Mail listening to complaints about too many stamps being issued! Even the Prestige book is one of the dearest ever issued. I don't know about the Doctors, but the Daleks did appear in the Millennium issue. If ever I needed confirmation that giving-up the collecting of modern British stamp issues was the correct decision back in 2000, then this set is it. If there is any saving grace it is that they are all first or second class values, but the delaying of the issue date may just imply that they are to be released after the next postal rate increase. This is blatant commercialism, probably brought about by the bosses insisting on even more profit from stamps than the cash cow that was the Olympics/Paralympics. 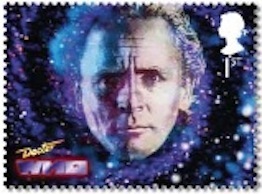 I expect stamp issues such as this to come from the likes of Grenada or St Vincent, not from the UK. 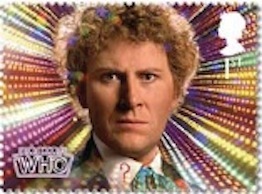 @jeff and @anonymous correctly identified the previous two incarnations of Doctor-actors on GB stamps. @Brian Morris - the PSB is highly priced but still only about £1 over face. And the stamps on the MS pane will be catalogued separately as they are gummed. We need more info about the Machins as well: the 87p (if gummed) will be new. This will be an enormous seller for Royal Mail and the BBC. @Anonymous - it was planned long before the Gold Medal success. RM always plan to have one issue a year which will be a major seller - Beatles, Album Covers, James Bond. With the diminishing use of postal services by both industry and the general public the RM cannot justify such a prolific issue. This issue is based solely on the world wide popularity of Doctor Who and therefore will sell well so RM pat your self on the back for a piece of first class exploitation. Oh! I expect a lot of flak on this one. issues on mail from dealers. I don't get enough social mail - most of mine is from customers, many of whom use 1st/2nd Machins much as I would prefer to get different new stamps. But the ones shown on the other thread are absolutely genuine non-philatelic usage. 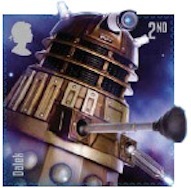 I collect Machins only, but I'm also a Doctor Who fan and I'm all for this issue. They will be the only UK commemoratives I'll have bought. Mind you, I'll draw the line at the Smiler sheets! Anyway, the time has long gone when the RM worried about philatelists in planning new commemorative issues. 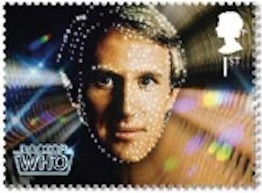 Some commemoratives are targeted at people who may buy only the one issue. In this regard I suspect I'm pretty much representative of the intended target audience. 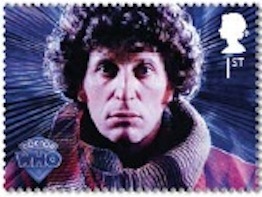 It will be interesting to see if they apply a security overprint to the Tardis stamp. Note that Royal Mail have announced another round of rate changes in early March so the prices shown here will probably all change. 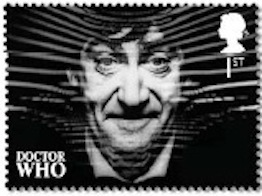 The portraits on the Doctor Who stamps represent the fictional figure(s); some of the actors who portrayed the Doctor are dead, some are not. 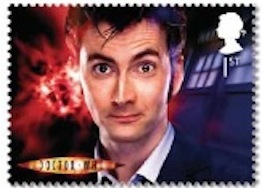 David Tennant and other actorsalso appeared on the Royal Shakespeare company issue in 2011, and other recognisable actors in the Magical Worlds set that preceded it. The Olympic/Paralympic gold medal stamps were on obvious exception to the old rule. And previous issues, such as the Ashes Cricket and Rugby World Cup miniature sheets were other examples. The rule now, apart from the Gold Medal stamps, is that the depiction is representative, or showing a scene. Thus in the Britain Alone set, the Evacuees and some of the soldiers were still alive, in the World Cup stamp in the Windsors miniature sheet some team members are still alive, the Girl Guides etc on the 2010 miniature sheet, the firefighters in 2009, etc. The old rule has been slowly eroded, and the current rule seems to be that (apart, again, from the Gold Medals) that stamps do not honour living people but they can be used for depiction of events or situations. I've now had clarification on the FDCs from Tallents House, and have added it to the main blogpost. Has Walsall produced the first British 3D-stamp? So where are the 6 x 1st Jubilee booklets ?